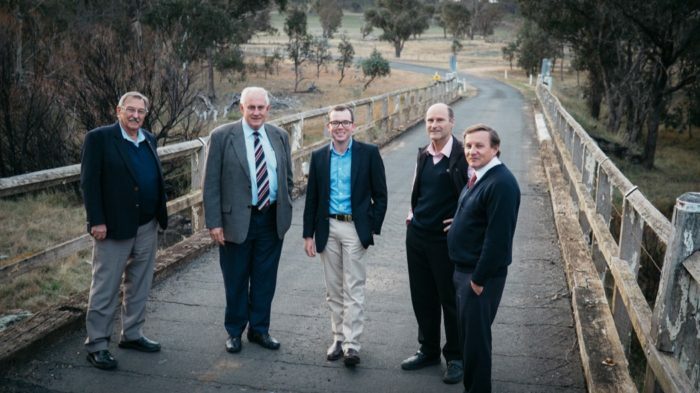 Former Guyra Shire mayor Hans Hietbrink, Armidale Regional Council (ARC) administrator Dr Ian Tiley, Adam Marshall, ARC engineer Ralph Stoekler, and ARC interim general manager Glenn Wilcox on Tenterden Road bridge. The old wooden bridge is to be completely replaced with a wider, stronger concrete structure. THE modernising of the region’s local road and bridge network continues at pace, with another $1.27 million of State Government funding announced today by Northern Tablelands MP Adam Marshall. Money from round two of the State’s popular Fixing Country Roads program will help Armidale Regional, Glen Innes Severn, Moree Plains and Uralla Shire Councils upgrade old timber bridges, widen intersections and assess the load capacity of other bridges on minor roads. “This is acknowledgement by government that the big arterial roads are not the only lines on the transport map,” Mr Marshall said. “Freight in our region has to negotiate the web of minor roads, most of them designed and built many decades ago for quite different transport requirements. “It has always been easy for governments to ignore these byways in favour of high-visibility projects. “The Fixing Country Roads program addresses those years of neglect by supporting local councils in their efforts to address important ‘last mile’ issues on their local roads. By contributing $152,300 into the widening project at the Mosquito Creek Road intersection in Pallamallawa, the government will help local agricultural enterprises and a blue metal quarry that services areas out to Walgett introduce AB-triple trucks, vastly improving transport efficiency. “The upgrade benefits 160,000 tonnes of freight connecting to the Gwydir Highway and is expected to lead to a 15 per cent reduction in heavy vehicle trips,” Mr Marshall said. $260,000 for Uralla Shire Council to replace Mihi Creek Bridge with a wider (two-lane) concrete bridge. The first round of Fixing Country Roads allocated $43 million. Three quarters of the successful projects have already been opened or are near completion. The first stage of the program co-funded the replacement of Abington Creek Bridge on Thunderbolts Way, a vital route between the North West and New England Highway that annually carries about 40,000 vehicles, including trucks carrying nearly a million tonnes of livestock. The existing bridge cannot support heavy and over-width vehicles, forcing heavy transport to detour about 30 kilometres. “When we open the new bridge later this month, that work by Uralla Shire Council will have effectively condensed 30km of driving for heavy vehicles into a few hundred metres,” Mr Marshall said. Round Two of Fixing Country Roads pumps another $50 million into the modernising of country transport routes. Councils in the Northern Tablelands electorate successfully applied for $1,267,300 of Round Two projects.